She has juggled radio, dubbing, MCing, theater and will soon be seen wooing and shaking a leg with Salman Khan on his show Dus Ka Dum. Mumbai is the city to be for this Delhi born and brought up girl who loves the josh and never say die spirit of the city. 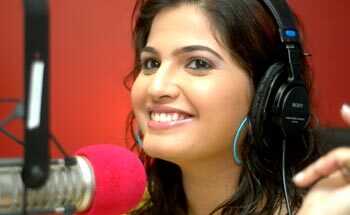 RJ Mehak in conversation with Harpreet Khokhar. I have been a radio baby all my life. I started doing radio dubbings as a child artiste. After finishing my studies, I gave an audition with All India Radio and was selected to host a show on AIR FM Rainbow. I have also worked for BBC Radio London as an outside contributor from Delhi, post which my journey into the private FM sector began with Radio City, Delhi. I shifted to Mumbai with City before I settled with Meow. Tell us more about your show on Meow. I used to host a breakfast show on Meow earlier. I took a sabbatical for a month, after which I joined and took up the afternoon slot. Now I host a full throttle entertainment show called 'Meow Matinee' from Monday to Friday between 11 am to 3 pm. The show basically talks about Bollywood stars, movies wherein I also interview celebrities. A very popular slot on the show is where we talk about yesterday's stars. Does being tied to a particular time slot affect you? Though radio listenership is very high in the mornings and evenings, at the same time, it is a very passive medium at this time slot since it plays in the background while people are busy with their work. In the afternoon, when the listeners tune in to you, their attention is more focused. The show format is more engaging so I have more time to connect with the listeners, talk to them at length about their lives instead of just talking about the happenings around. Till Some time ago, it was important for an RJ to be a mystery and people would create their own perceptions about the RJ. But now, a lot of money is riding on them. They are hailed as celebrities which was not the scenario a few years back. We all remember Roshan Abbas or Ameen Sayani who hosted Binaca Geet Mala because of their magical and captivating voices. But let's face it - at the end of the day - radio is showbiz. If a radio station thinks showing the RJ's face may raise the revenues, then I think it is a great strategy. You were a part of a community radio station in Delhi. What is the importance of CRS? I was heading a community radio station in Delhi at IIMC, where i was a radio faculty. Community radio is a rage in rural areas though it is struggling in urban areas where radio is more of an entertainment medium. For instance in Delhi, women do not feel secure, so if there is a radio station for women, it will be very helpful. There they can talk about their problems and how to tackle these issues. CRS is in its nascent stage - it will take some time to grow. Private FM stations are more about glamour, being uptown and connecting with the audience. Community radio station is a non profit making organization - the people who work are also voluntary workers. The reach is not that much but it is very helpful if it is taken up for a cause. How is working with private radio stations different from working with AIR? AIR has its own restrictions. Infrastructure these days is very impressive though and a lot of money is put into it. People go to AIR as their training ground and move to private stations since it doesn't pay you that well. I got a meager Rs 500 per show and you cannot do more than eight shows a month. So you have to look for more avenues. It is a tricky question so I wouldn't want to comment on it (laughs). But everybody wants to listen to masala. One really needs to find ways to regenerate the audience interest constantly. Like they say, â€?No good girl has ever made it to history'. A plain Jane would not stay in the audience memory for long. An RJ needs a kind of personality where they are different from the masses but still connect with them. They need to be eccentric and quirky otherwise they will go unnoticed. They also need to be more creative which is where the challenge lies. Sometimes, they do talk for the heck of it just to fill the spots. Rather than taking content from newspaperS and reading it out, RJs need to come out with avenues that are not explored. Creativity is the need of the hour when it comes to content. You will be appearing on television show â€?Dus Ka Dum'. Tell us more about it. Being on the show was one experience I am going to cherish for a long time. With me, the show shifts to the common man as participant Salman and I danced together, pulled people's leg. I was holding a huge hoarding saying â€?Mujshe Shaadi Karoge' and Salman put a varmala around my neck. He also went down on his knees (sighs). I had one kickass experience being a part of the show. Salman has even promised me to take me out for a coffee and come on my show for an interview!! You have also hosted a lot of television shows. What is next on our plate in television? I have hosted shows on ETV Urdu, DD Metro and anchored Chitrahaar in the past. I have also been invited for panel discussions relating to the radio sector. I have even directed a couple of telefilms. But right now, I am concentrating on me being the performer. I have recently participated in a reality show on Zing starting on 11 July called â€?Zing ne bana di jodi' where I got an opportunity to interact with eight other couples. I wanted to experience the reality show phenomenon and be a part of it. People listen to me every day but they don't really know who Mehak is. Their perception changes once they know you personally, they connect with you in a much better way. So my main motive of participating in a reality show was for the audience to know me more upfront. You have dubbed for an international project. Can you elaborate on that? I am a dubbing artiste and have done a couple of projects. I have also dubbed for a Disney show called 'Wizards of the Waverly Palace' and couple of other commercials as well. The international project that I have recently dubbed for is a Chinese film called 'Red Cliff' directed by Joh Woo, the director of Mission Impossible II. I dubbed for its English Version for a character who is a princess. It is not a very big role but nevertheless a very pivotal one. What is on the anvil now? Currently, I am concentrating more on television and radio. Increasing my television presence is something I am looking forward to. I am also doing a theater play called 'Sahib Biwi Ghulam'. I am also trying to work more on my afternoon show on radio. It is a big challenge as to how to make the slot more interesting. There are also a couple of films I am being talked into but it is a very half baked proposition. One thing you would like to change about the radio sector? News should be included in the private radio format. If private radio stations are allowed to broadcast news, it will change the face of the radio industry in India. What do you think is the future of radio sector? Though radio is going very slow in its development, slowly it will outshine as an important medium for the entertainment sector. Revenues on radio are less when you compare them to television because advertisers think that an ad on national television will connect more with the audiences than radio, which is a local medium. But people connect with the RJs on a very personal level, what plays on radio stays in memory for long. Also, I think the government will be a little lenient with the radio industry as far as news is concerned, hence bringing a drastic change in the format So, ten years down the line one will see radio sector booming in a big way. Retro music could be the flavour of the season, but Radio City was one of the pioneers in the space to identify the demand for music of the bygone eras. It's show Kal Bhi Aaj Bhi started seven years ago and shows no signs of slowing down. NEW DELHI: Fayyaz Sheheryar is the youngest ever Director General of All India Radio. They are making a comeback. We are referring to the two chatterboxes from Radio City circa seven years or so ago who zipped of to West Asia. But before that Jaggu (Ashish Jagtiani) and Tarana (TV actor Tarana Raja) had built a loyal audience to their breakfast show Good Morning Mumbai.